Villa Kawi’s tranquil setting at the end of a leafy avenue creates a peaceful hideaway right in the heart of Seminyak; a district famed for its long sandy beach, world-class restaurants, trendy bars and designer boutiques. Named after a sacred mountain in East Java, where thousands of pilgrims go to seek blessings, Villa Kawi has a contemporary Balinese design, blending dark and natural timber with creamy stone. An ode to elegant tropical living, minimal adornments include sprays of orchids and a smattering of local artwork. The atmospheric open-sided living pavilion has tall sloping ceilings and overlooks a swimming pool fringed with panda nus palms and frangipani trees. Two spacious air-conditioned bedrooms have delightful courtyard garden bathrooms. 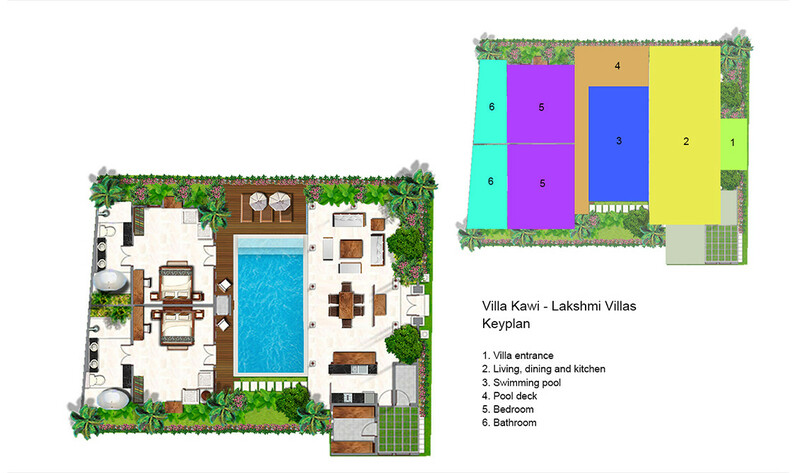 For those needing an additional bedroom and extra space, Kawi can be connected to the adjoining one-bedroomed Villa Solo. Whether you want to stroll down to the world-class dining venues of ‘eat street’, shop till you drop, lounge on the beach, or sip cocktails at sunset, the opportunities that come with a stay at Villa Kawi are endless. The swimming pool is a central feature at this single-storey villa, with an open-plan living area and kitchen on one side, and two adjoining bedrooms on the other. A door in the garden wall connects to Villa Solo for those who wish to add a third bedroom. A guest kitchen with granite counters adjoins the lounge room, and provides all the essentials for tea and coffee-making, cool drinks from the mini bar, or for whipping up a quick meal. King-size beds (one of which beds can be converted to twins) are draped in silky mosquito nets and dressed in crisp white linens and deluxe pillows. Comfortable chairs form a sitting area and a flat-screen satellite TV with DVD player provides entertainment. 4 adults (2 bedrooms: 1 with king-size bed, 1 with twin beds that converts to a king). 2 additional beds available at extra charge. Barbecue, back-up generator; safe deposit boxes in each bedroom.